Last week, my husband's family drew names for Christmas gifts. We've been doing that for three years and I really like it - it's nice to not have to buy a ton of gifts and instead just focus on getting one person something they'll really like. But, it's just too soon. I am having trouble even wrapping my mind around the fact that Christmas is almost here. Wasn't summer over like yesterday? Despite my denial that holiday season is here, it's probably a good idea to start thinking about gifts. 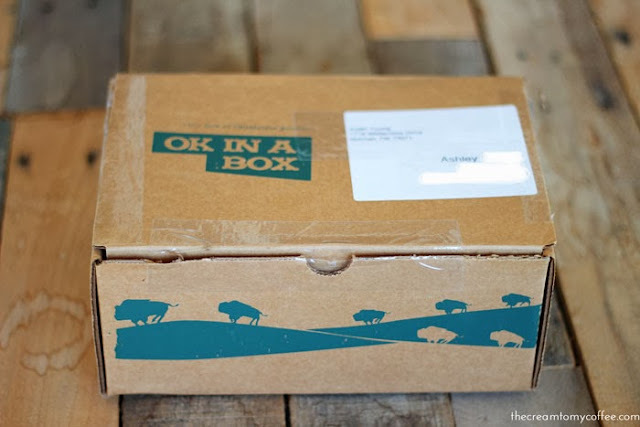 I have a fun gift idea that I want to share: Oklahoma In A Box. Oklahoma In A Box is a box of surprise Made in Oklahoma goodies delivered to your doorstep each month. Each month has a new theme and new items. Every item is the box is made in Oklahoma and the box even includes a cute little map of the state to show you where everything came from. I have really loved everything in the box so far (especially those pecans... those are already gone). 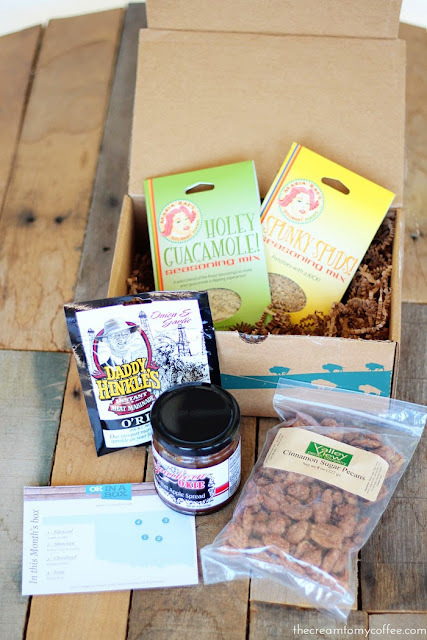 I definitely recommend Oklahoma In A Box subscription as a Christmas gift! I think it is such a fun way to showcase cool items from our great state and I think it would make a fun gift for people from Oklahoma who no longer live in the state. Right now you can get $10 off your first order! Just use this link and your coupon will be applied at checkout. Disclaimer: I received my first box free, but I think it's a great product and all opinions are my own! I bought this for my in-laws! They are from Oklahoma orginally and will LOVE it! Thanks so much! What a neat idea!!! I wish they did every state!! That'd be cool! I always love Christmas ideas. It can be so hard to think of things for some of husband's relatives. This sounds so cute (and looks really yummy)! What a sweet idea. I always foolishly leave the holiday related shopping until the last minute. how cute is that?! What a great idea! Weren't the pecans so good! ?